Motorcycles not only provide convenient transportation, but they also form the basis for deep-seated leisure and adventure. However, they are unlike other vehicles in the sense that they are lightweight, making them a natural target for thieves and robbers. Many riders do not bother securing their bikes. As a direct result, the crime wave against bikes and their accompanying accessories has gone up. To ensure that you are not hit, you need to take precaution and invest in the best wheel locks for motorcycles. Although your primary concern as you shop for the best wheel lock for your bike would be the level of safety and security it will provide, you might also be interested in finding something that is as sleek as your bike. 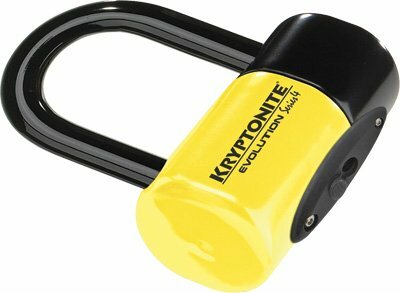 In this, the Kryptonite 000884 Keeper 5s Yellow Disc Lock takes the biscuit. Attractive and brightly colored, you can be sure that anyone within a couple of yards will tell that your bike is well secured. 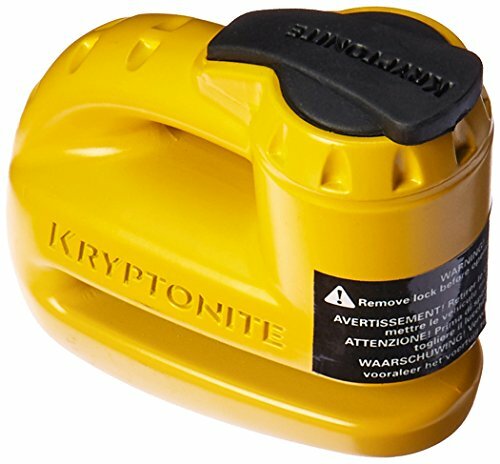 However, there is more to the Kryptonite 000884 Keeper 5s Yellow Disc Lock than attractive looks. In fact, the security efficiency of the lock is so reliable that you will soon wish you had bought it earlier – if only to alleviate your fears and insecurity. Additionally, the lock is durable on account of its weatherproof construction. Since it is made using hardened steel, therefore, you can rest assured that it will continue keeping your motorbike safe and sound over the long haul. Another one of the best wheel locks for motorcycles, the Kryptonite Series 4 Disc will provide maximum protection but at a value-added cost. The manufacturer designed it in full knowledge of the needs of the typical biker. 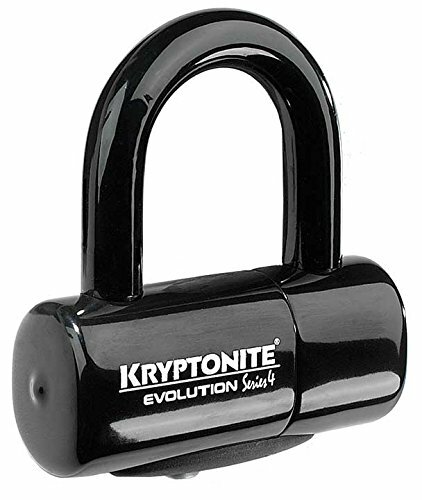 This means that you can rely on the Kryptonite Series 4 Disc lock to keep your bike safe and secure at all hours. As an example, this lock boasts 14mm hardened steel – which is resistant to force and cutting action. The disc lock also comes with the proprietary double deadbolt locking mechanism, which means that it will not twist irrespective of how much force a thief applies to it. A better version of the above option, the Kryptonite Series 4 Disc Premium Packaging Orange (MOTO),14 Millimeter works best for riders living in areas that are prone to motorcycle theft. The exceptional lock will not only guarantee outstanding security, but it will also keep you feeling peaceful in the knowledge that your bike is well-secured. For instance, the 14 mm shackle was made using hardened steel that will resist cutting and all other types of pilfering attacks. Similarly, the manufacturer enhanced the cylinder with pull and anti-drill capacity. However, the most interesting feature of the Kryptonite Series 4 Disc Premium Packaging Orange (MOTO),14 Millimeter lock is the million plus key combinations, which would make it hard even for Houdini to unlock. Ranked among the best wheel locks for motorcycles, the YOHOOLYO Alarm Disc Lock Anti Theft Lock Security Alarm Disc Disk Lock Padlock with Alarm Sound 120db for Motorcycles, Bicycles and Scooters offers an excellent way to shield your bike whenever you are out on the town making quick trips and dashing from one place to the next. All you need to do is hook it to your wheel, and the 12odb alarm will do the work for you. 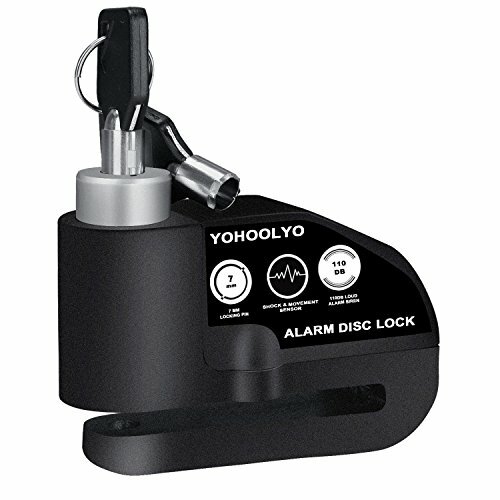 If someone tries tampering with the YOHOOLYO Alarm Disc Lock Anti Theft Lock Security Alarm Disc Disk Lock Padlock with Alarm Sound 120db for Motorcycles, Bicycles and Scooters, it will emit loud and prolonged beeps at intervals of about 10 seconds. This will, as you can imagine, cause any potential thief to run off before they are caught. 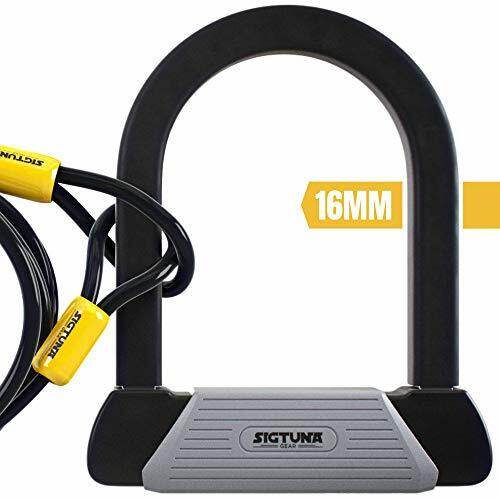 SIGTUNA Bike locks – 16mm Heavy Duty Bicycle U Lock Combo with Square Steel U-Lock Shackle and 1800mm Woven Steel Double-loop Cable Chain plus Key-hole Cover and 2 High-Security Keys Affordable and durable, this disc lock will add to the security of your bike without taking too much of your savings. Further, this lock is relatively easy to use and of a reliable quality. It is because of these features that the SIGTUNA Bike Lock is highly sought after by the most conscientious and security-conscious of riders. However, thieves are not just excited by motorbikes. They also love seats and wheels because they are harder to identify as stolen goods. Others go for brakes and baskets, and just about any other removable bike part. If you left your motorcycle for long enough, you will most likely find a raw shell in place of the gleaming beauty you adore. If you have ever had your motorbike pilfered, you probably understand the importance of investing in the best wheel locks for motorcycles. You understand the emptiness, denial, and anger that accompanied the crime, as well as the trauma you had to undergo after that. Instead of waiting for the bike phantom to strike again, you might want to take all necessary precautions to prevent thieves from getting through to your hard-earned investment. This is where motorbike wheel locks come in. The first step would be to minimize the opportunity for thieves to get through to your bike. As an illustration, you can keep thieves of opportunity at bay by investing in and using such devices as U-locks, cable locks, chains, and disc locks. Since the potential vagrant would have to work through the lock on site, it is highly likely that they will eventually give up and move on to the next target. More earnest thieves will be looking to pull a lift-away. Here, a group of criminals will drive around in their sordidly large vehicle in search of desirable targets. When they spot something they like, they will lift it locks and everything – and stow it away in their truck before driving off. To ensure that this does not happen to your little speedster, you might want to get the best wheel locks for motorcycles. More particularly, invest in a security system that will allow you to immobilize the motorbike, such as by securing it to an immovable object. Whether the object you attach your bike to is an in-ground anchor or a permanent structure, you can be sure that no one will be making away with your bike in the near future. Although you might be tempted to invest in several cheap locks to offset your security costs, this is not the best way to go. Rather, you would be better off with a single lock of such a high quality that no one could hope to prise it open. In many cases, you will find that the best wheel locks for motorcycles often come with cylinders and shackles of hardened steel. To remove these locks, you would need grinders and torches – gadgets that many petty thieves would not consider investing in. According to most police guidelines on vehicle protection, the standard pricing of your bike security system should be a reflection of the value of the bike. To this end, the best wheel locks for motorcycles should cost anywhere between 10 to 15% of the value of your motorbike. Although this might seem vague, you will realize that it is a thought-out guideline. If you shop around for wheel locks and other motorcycle security system, you will realize that the better quality products are usually higher priced. Even if you might be looking to cut down on your expenses, there is nothing wrong in splurging on your bike’s security. After all, you invested a significant portion of your savings/earnings on the bike itself. Why not do the same to get your hands on the best wheel locks for motorcycles? So, what does a robust and top rated bike wheel lock look like? How can you tell the difference between a high-quality product and a flimsy one? If you are shopping for the best wheel lock for your bike, you need to watch out for a couple of features – most of which are related to the material and the style. According to most security experts, the best, most effective security styles include chains and U-locks. Designed to proof your bike against theft, most of these locks are made using metal that no one can cut through. Further, these styles are convenient to use. The cable lock, on the other hand, is the less efficient at deterring would-be criminals. Anyone can cut through such a lock using bolt cutters and a bit of brute force – depending on the circumstances, of course. Regarding material, you will usually find that the best wheel locks for motorcycles are made using hardened steel. Most of the cheap bike locks, on the other hand, use soft alloys that you can cut through easily if you have the right Sawzall, hacksaw, or bolt cutters. Hardened steel works best because it is impervious to all attempts by bolt cutters and hacksaws. To work through the lock, a thief would have to spend 6+ hours cutting and hacking away. However, this is not to say that hardened steel is 100% efficient. It only acts a deterrent because a vagrant interested in pinching your motorbike would have to use an angle grinder. As you probably know, these grinders are quite noisy. They also create showers of sparks while working through hardened steel something that no one will want to happen when they are trying to steal a bike. So, there you have it – the best wheel locks for motorcycles. Irrespective of the choice you make, you can rest assured that each of these options will serve you well and keep your motorbike safe and secure whenever you are not around to watch it. Our recommendation, however, would have to be the Kryptonite Series 4 Disc. Not only does it come with essential features of a reliable disc lock, but it also boasts tons of key combinations, meaning that a potential vagrant will have a hard time cracking it.